sheepless in suburbia: Getting ready for the tour de .... fabric? Getting ready for the tour de .... fabric? Now historically this time of year can only mean one thing. It's time to start getting ready for TDF. As in Tour de France - which for me has traditionally meant the Tour de Fleece. This year however I have decided to add a twist. Instead of picking up spindle and wool or treadling madly through my stash on my spinning wheel for the entire month of July - I am swapping out the "F" in the TDF to include Fabric - as in the Tour de Fabric. As many of you already know I have been working on a not so traditional Hexagon Quilt and have become quite enchanted with the process of handstitching (see sheepless quilts if you are looking for more details). Having said that - if you're doing the traditional TDF (as in fleece) I hope you have a wonderful time. If you're going to challenge yourself with the Tour de Fabric (as I am ) let me know - I'd love to hear from you! 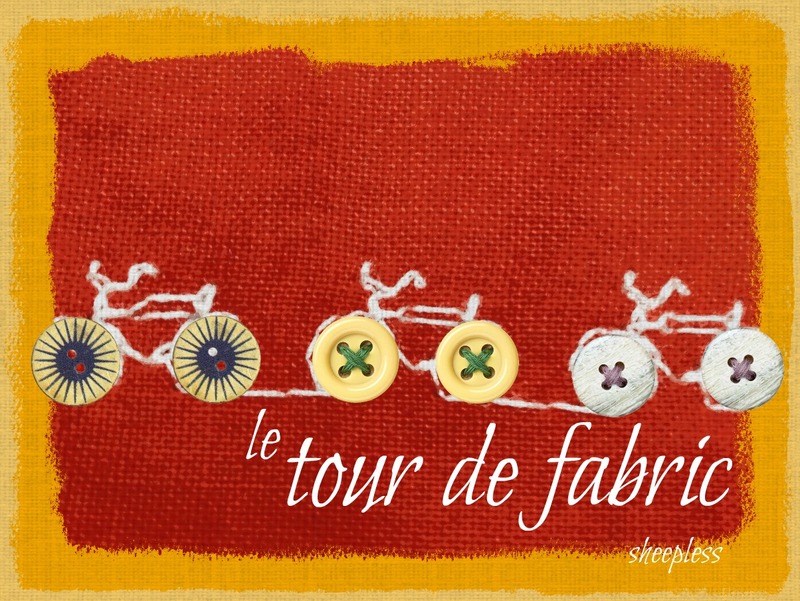 Welcome to le Tour de ...Fabric?